How can the Tories survive? A focus on Theresa May’s premiership is a distraction from the real challenges facing the Conservative Party, writes Evgeny Pudovkin. By now politicians have learned that it is always too good to last. The last century skimped on appeasing ideologues’ visions. British Fabianism – the teleological pursuit of socialist society – withered away with the 1976 IMF crisis. Free-marketers’ aspiration to dismantle the welfare state completely, in its turn, was constrained by the electorate’s devotion to the NHS. British politics, therefore, has been less about inevitable progression and more about cycles. Today we may be witnessing another sea change. The status-quo is being undermined simultaneously on two fronts. Debates over the role of the market continue to reverberate. Yet it is not just economic consensus that is at stake. The establishment’s views on culture and identity, too, are being brought into disrepute. To an extent that is little appreciated, Tony Blair’s period in office was transformative. The main difference between Blairism and what came before, was its approach to social norms. Under New Labour, Britain chose not to impose any transitional restrictions on migration from the EU when ten new countries joined the bloc in 2004. On integration, Blair embraced multiculturalism in place of assimilation. The former approach (for better or worse) ignored the existence of so-called ‘cultural distance’ between different groups and denied the impact of religion on political views. It is this model of ‘Blatcherism’ – an unrestrained free-market plus multiculturalism – that popular attitudes are turning against. As regards the economy, British Social Attitudes found that 48 per cent want spending and taxes to rise, the largest proportion in a decade. On top of that, the majority also favour nationalisation of large industries including water (83 per cent), electricity (77 per cent), gas (77 per cent) and trains (76 per cent) according to data published by the Legatum Institute. On immigration, a YouGov poll revealed that 70 per cent want overall numbers reduced. Meanwhile, it is not just the quantity of migration that people would like to change, but the composition, too. Namely, Britons want more migrants from the countries with a similar cultural and economic profile. The majority in the UK would thus welcome more migrants from Northern Europe, while restricting migration flows from Eastern European, Muslim-majority and developing states. If you need further evidence that ‘Blatcherism’ faces troubles, look at the collapse of the soft-left across liberal democracies. Here, the decline of Labour moderates is only one example among many. It is against this backdrop that current electoral struggles should be considered. What is next for both the centre-right and the hard left? 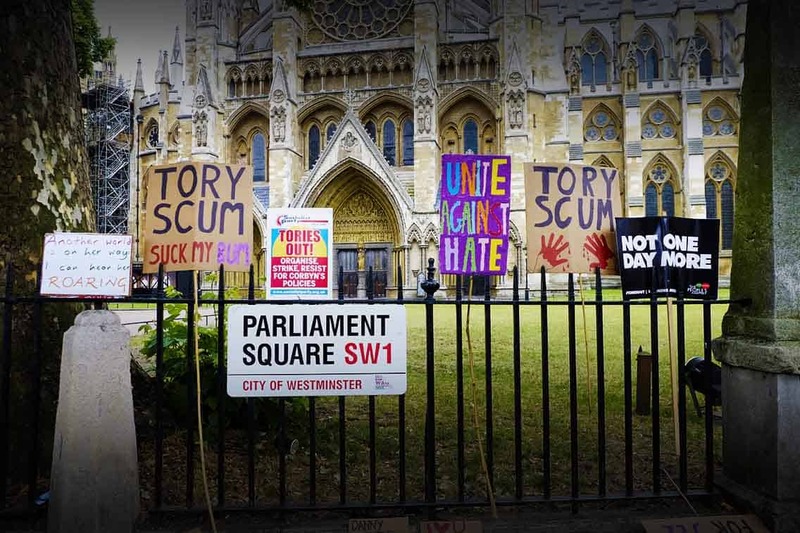 One way to improve the Tories’ fortunes involves moderating their stance on the economy, while ramming home a more conservative and patriotic message on social issues. This is how both Theodore Roosevelt and Richard Nixon managed to bring the US Republicans into power in 1901 and 1969. But this is more easily said than done. ‘Mayism’ did not get off the ground at the last election as many hoped it would. The Tories managed to increase its popular share of the vote among the working-class from 27 per cent to 45 per cent, yet still came short of the majority in many Labour seats and lost too many middle-class constituencies. Just to what extent this failure was due to May’s own shortcomings – or the electoral tactics in general – is ambiguous. Then there is Brexit: it is not clear how the Conservatives could reconcile a moderate economic agenda with opening up the UK to imports from around the globe. Finally, a ‘moderate’ Tory candidate cannot just plough ahead with a new agenda; he or she would have to sway the party’s membership first. That is not to say that Labour doesn’t have its own problems. The first is that the party’s ambiguity on Brexit cannot last forever. At some point Corbyn will have to either affirm his ‘hard’ Brexit position and alienate his younger supporters or opt for staying in the EEA and risk further eroding the party’s working-class base. Another drawback of the hard left’s platform is its perceived weakness on immigration, national security and welfare. Personal responsibility and military strength are not among the causes Labour is generally known for championing. So, what can Tories do to tip balance in their favour? Evgeny Pudovkin is a journalist. His main interests include British domestic and foreign policy, Russia and foreign affairs.